#ODDbeats – Yoni Berk’s Spotify Playlist – Influences from 90’s to – ’08. Being a well playlisted yoga studio brings us pride. But we don’t make those playlists. TEACHERS DO! Yoni teaches Monday and Tuesday nights in Silverlake. He’s a pretty classic teacher, with O.D.D. on brand bad jokes, and AMAZINGLY DIVERSE PLAYLISTS! Music has always been a huge part of my life. As a child I could be found wandering around the playground singing The Little Mermaid. In elementary school I played piano and clarinet in the school band. In middle school I sang in choir and musicals. In high school I took voice lessons and taught myself guitar. As an “adult” I’ve performed in bands(we played our first show at one down dog!) and go to see other bands play as often as I can. And if I’m being completely honest, I can still be found singing The Little Mermaid from time to time. I think it’s safe to say that everyone here at One Down Dog loves music, too. Check out some of the other music we’ve shared. Want to suggest some awesome tunes? Feel free to share them with us here in the comments, on twitter, facebook or email. It’s getting cold outside. Ok who are we kidding, it’s LA:) Regardless we are spending a lot more time inside, hanging with friends and family for the holidays, so why not spend that time listening to great tunes? Nothing like a good holiday dance party with family and friends. As you know, we LOVE music – how it makes us feel and how it gets us moving. We know you love it too. That’s why every month we share our top 10 favorites! Ever wonder, “what is this amazing song?” while down-dogging in class? Wonder no more – here’s our December top 10 for your listening pleasure. This month we are grateful for excellent tunes to celebrate the holidays with. Nothing like a good holiday dance party with family and friends. 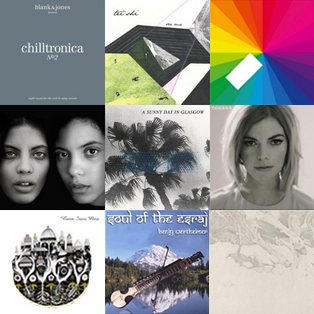 Wonder no more – here’s our November top 10 for your listening pleasure. Music is life, life is music. Dance like no one’s watching. Wonder no more – get our yoga playlist favorites every month! At One Down Dog we LOVE music – how it makes us feel, how it takes us back, and how it gets us moving. Music is life, life is music. Every month we share our top 10 current favorites in our monthly yoga playlist for your listening pleasure. 8. If You Didn’t See Me (Then You Weren’t On the Dancefloor) – Dale Earnhardt Jr. Jr.
What are you listening to this month? Tell us in the comments below.